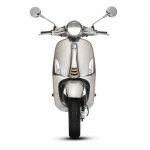 After first announcing the Vespa Elettrica project at EICMA a year ago, the electric Vespa is now ready for production, with Piaggio confirming it will be available worldwide, with orders being accepted in the spring. 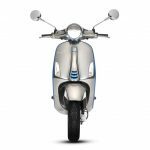 The 2018 Vespa Elettrica will be offered in two versions, the standard model which offers a range of 100 km (about 62 miles) or the X model which uses a gasoline-powered generator that increases the maximum range to 200 km (124 miles). 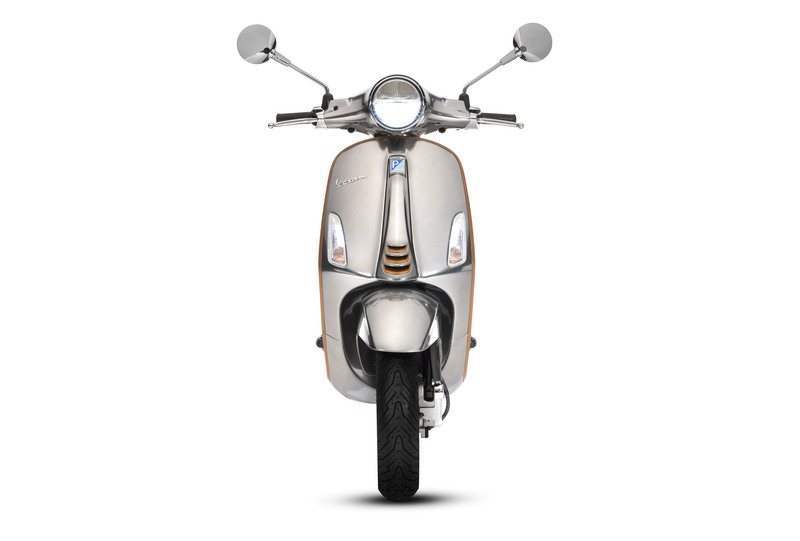 The Elettrica is propelled by an electric motor claiming peak output of 5.3 hp (with a continuous output of 2.7 hp) and more than 147.5 lb-ft. of torque, which Piaggio says is superior performance to a traditional 50cc gasoline-powered scooter. 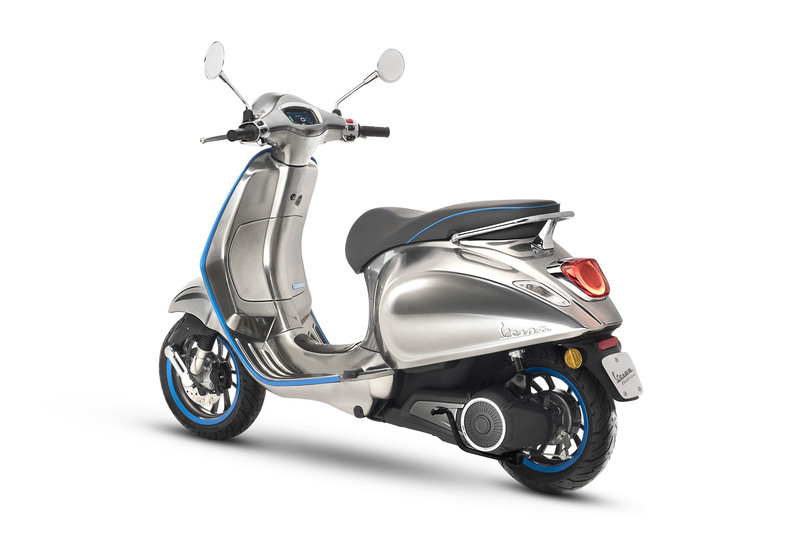 The Elettrica offers to operating modes, ECO and Power. 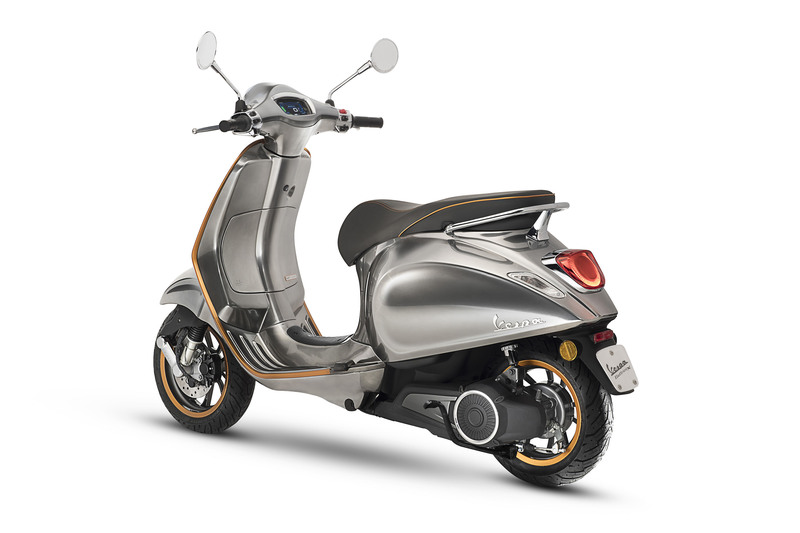 In ECO mode, acceleration is more gradual and the top speed is capped at 30 kph (about 18.6 mph), while Power mode offers full speed and acceleration. 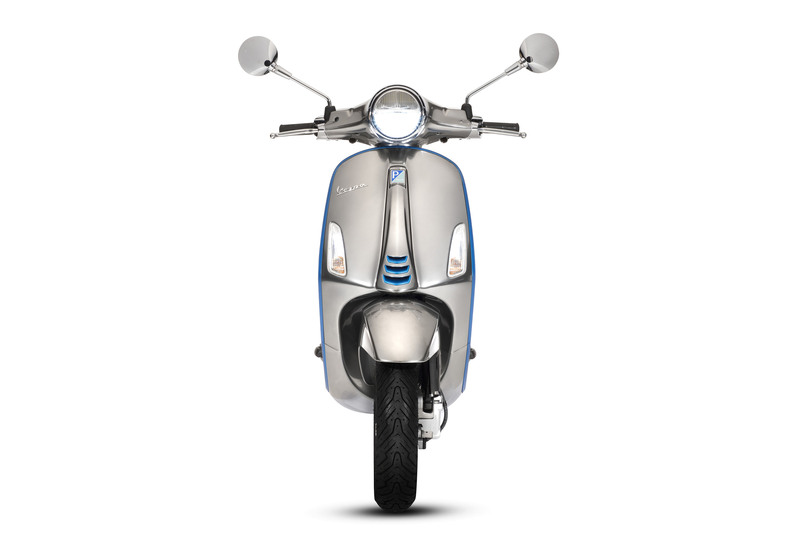 The electric scooter also has a reverse mode. 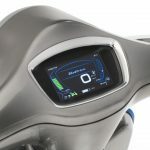 The Elettrica’s 4.3-inch TFT display offers four levels of brightness and can adapt to different lighting conditions. 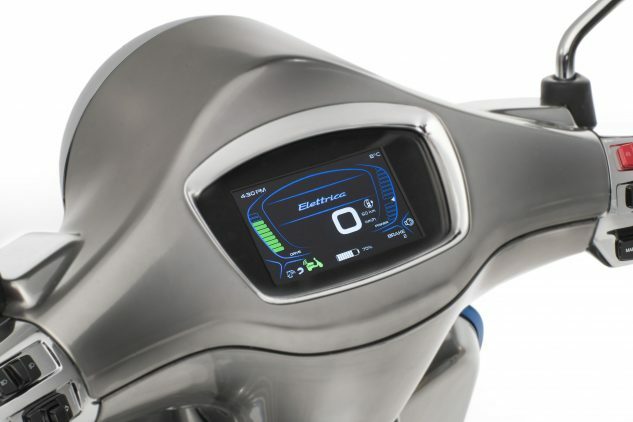 The Elettrica is also Bluetooth enabled, allowing the display to show incoming messages. 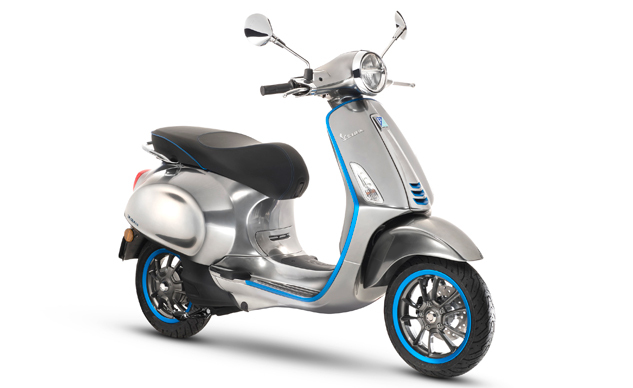 The motor is powered by a lithium-ion battery which can regain some spent energy through regenerative braking. The battery can also be charged by pulling out the charge cord from the seat compartment and plugging it into a regular wall outlet or public charging station. 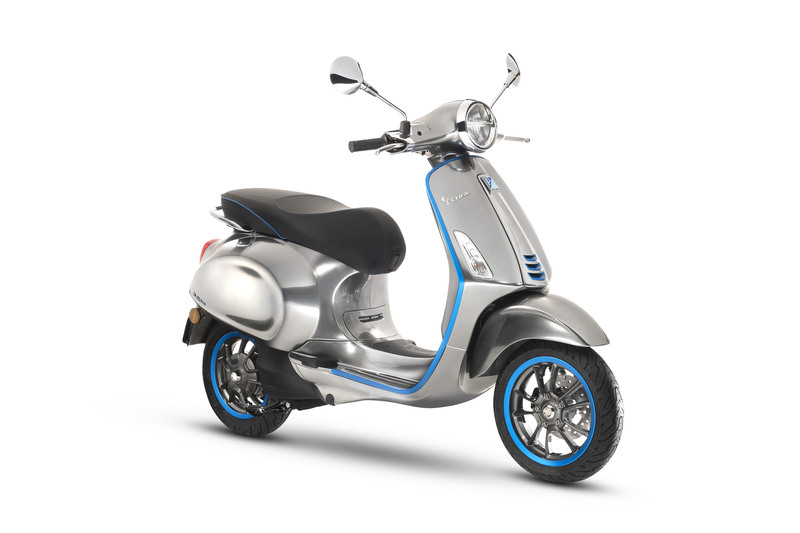 Piaggio claims a charge time of 4 hours. 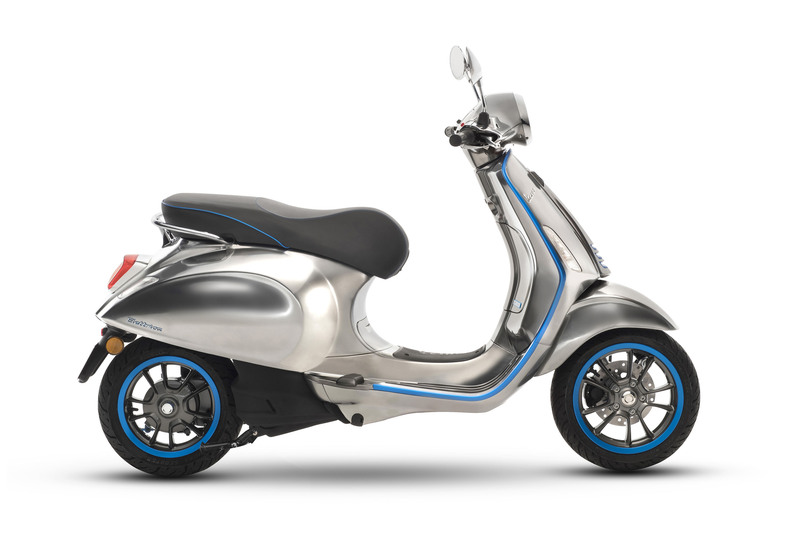 The range-extended X model is equipped with a generator fueled from a 0.8 gallon gas tank. To make room for the fuel tank, the X model has a smaller battery pack which only offers a range of about 30 miles on its own. With a generator, the claimed maximum range increases to 124 miles. 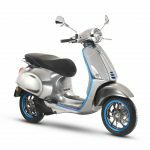 The generator automatically activates when the battery level drops below a certain threshold, but it can also be activated manually. 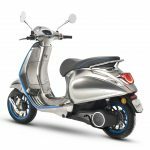 According to Piaggio, the battery pack is good for up to 1,000 full charging cycles, with an estimated life expectancy of 10 years or 32,000 to 44,000 miles of urban travel. 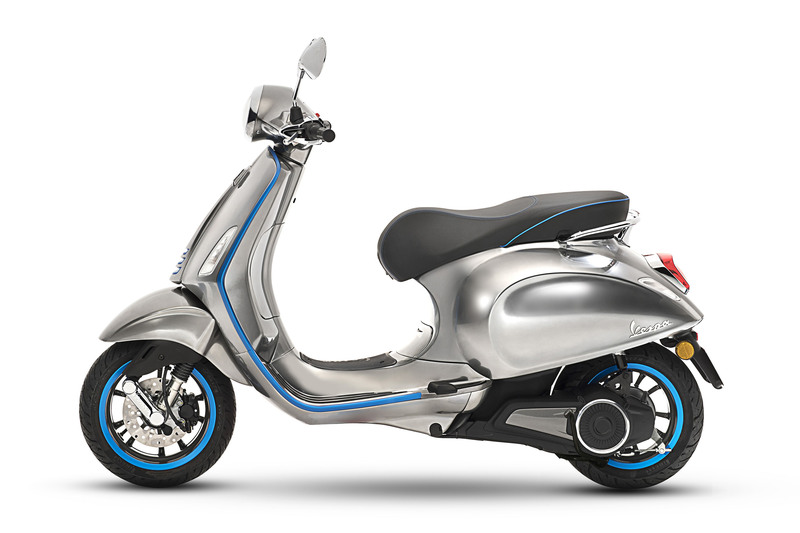 After reaching 1,000 charges, the battery’s capacity will decrease to about 80%. 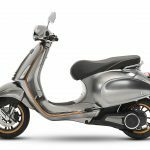 Other features include an LED headlight, underseat storage large enough for an jet-style helmet, a USB socket, 12-inch front wheel and 11-inch rear wheel. 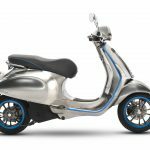 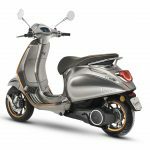 The Vespa Elettrica will be avialable in a chrome gray finish with metallic reflections and a choice of seven trim colors: blue (standard for the base model), orange (standard for the X version), chrome, yellow, green, a deep black or a smoky black. 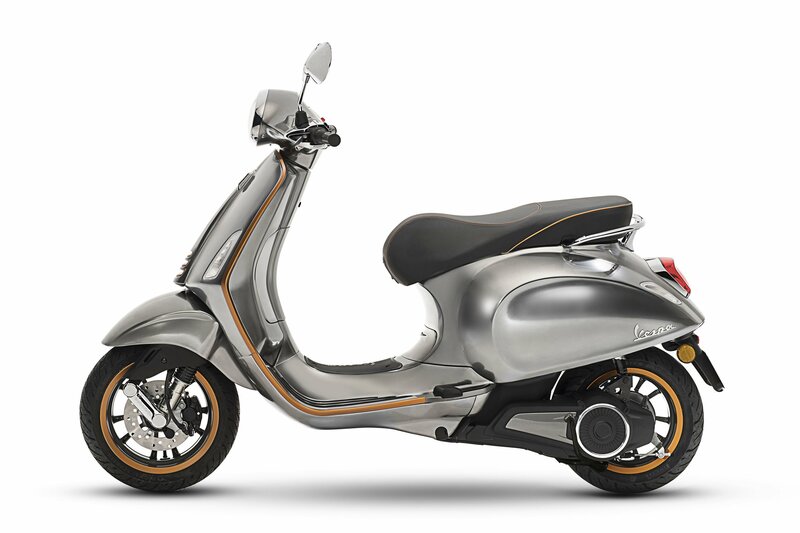 U.S. availability will be announced in a couple of weeks at the Long Beach IMS.